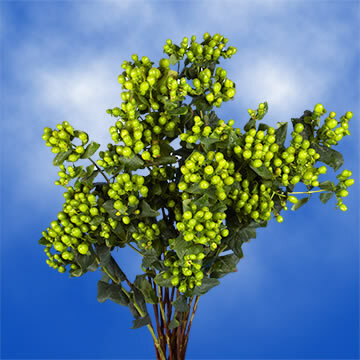 The Hypericum looks like a fruitful cluster of juicy berries with bright green leaves. It is an eye catching flower, an ideal filler for stunning floral arrangements. Each stem has an average of 10 to 14 berries. Available in different colors. Great filler for all your flower needs. Your flowers and roses are shipped absolutely fresh, direct from the greenhouses to you via FedEx. Globalrose sells wholesale flowers and wholesale roses at prices that are usually lower than most local wholesalers. All our flowers and roses are cut specially for you, your loved one or special event (wedding, party, fundraising event, birthday or holiday), 3 days before they are delivered to your door. Color tones for all flowers and roses may vary due to the computer monitor and/or Mother Nature.